Indigenous Fijian polity before European contact was characterized by political contests and inter-tribal rivalry among indigenous Fijians. However, with the arrival of Europeans and their technology, indigenous warfare changed, enabling the chiefdom of Bau to become a hegemonic power in eastern Fiji via tactical political positioning and strategic maneuvers. The alliance between the chiefs and the Europeans was strengthened by the formation of the Cakobau government in 1871, but internal conflict between indigenous Fijians and Europeans over governance and security forced the Europeans and the chiefs to cede Fiji to Britain, which modeled indigenous administration as humanitarian colonialism. Disparate groups of indigenous Fijians subscribed to a singular cultural identity and the authority on indigenous land lay with the Council of Chiefs. In addition, the British introduced a new ethnic category to the colony of Fiji in the form of Indian indentured laborers, and this new ethnic group led to a three-tier ethnic structure where indigenous Fijians were owners of the land, Europeans controlled commerce and the economy, and Indians and Indo-Fijians provided cheap labor. The ethnic terrain chartered by the colonial administration in Fiji created a problematic historical landscape with constant Indian agitations for political equality and common roll before independence and indigenous Fijian and European resistance to Indian demands. 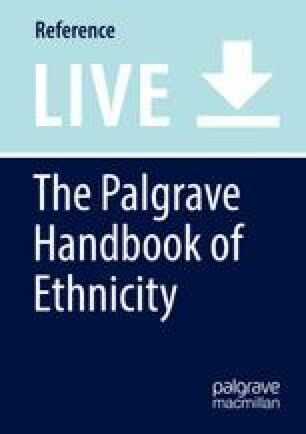 This article explores the ethnic history before cession and the historical and political dynamics of conflicting ethnic social forces.